While betrayal comes in many forms, certainly among the very worst is the betrayal of a child by a parent. As a therapist, one hears perhaps too many of these stories for comfort. There are generic ones, where parents steal money or credit cards from their offspring; use up the college fund that a grandparent left the child; and perpetrate (or allow) verbal, physical, or sexual abuse. Then there are the very particular and peculiar ones that require some amount of invention, but still break the heart. Take a set of parents who invested themselves in “surface” things — how they looked to others. They needed the right car, the right house in the right neighborhood, the right clothes, and the right friends. And so, when one of their children had a less than attractive nose, they required this youngster to have a “nose job.” The youth was OK with the nose that nature had delivered, but this wasn’t satisfactory to the parents. You might say that the surgery benefited the youngster, but only on the surface. It delivered the message that the child’s opinion (the desire not to have the surgery) didn’t matter, that a frightening and unnecessary operation would be inflicted, and that the offspring was not good enough without a cosmetic overhaul. All of this negated whatever benefit accrued to looking more pleasing to the eye. Another example. Two sisters. The younger was very bright, but not particularly attractive. The older one was gorgeous, but not so bright. What did the parents do? They referred to them in public as “the smart one” and “the pretty one.” Both compliments, it’s true, but so ingeniously fashioned and used that the real message to the younger one was “You are ugly” and to the older one “You are stupid.” Devastating. Or the parents whose oldest child committed suicide by using a handgun that had been given him by his father. After the funeral the father gave the gun to the brother next-in-line. Next-in-line for what? What was the unspoken message here? How about the young man, a college student, disliked by his abusive father? This was back in the days before the voluntary army, back in the time of Vietnam and the draft. The father knew that his son needed to manage a full-time course load in order to keep his student deferment. So what did the father do? He required that his offspring pay rent to stay in the family home knowing that his kid couldn’t afford it, even though the money wasn’t essential to the upkeep of the residence. Ultimately the young man couldn’t manage his studies because of the job. He had to quit school and was drafted, then sent to S.E. Asia. His father never wrote him letters in those days before email and, in fact, sold all the son’s possessions including his car while he was overseas. What was the message from father to son? I don’t want you to succeed? I don’t want you home? I don’t expect you to survive? I don’t want you to survive? Or all of the above? Why do they do it? The parents, I mean. First off, we know that if you have been abused by your parents, you are more likely to abuse your children than those people who have not had this awful experience. In effect, you are at risk of becoming the thing that you hate, perhaps even rationalizing the brutal behavior of your dad or mom. “They did the best they could” is a common theme that adult children use as they reflect back on their parents’ approach to child rearing and try to minimize and normalize the mistreatment they received. Similarly, the words spoken by the abusive parent, “I’m only doing this for your own good,” often serve as a “cover” for less than benign intentions. Children who are being abused have little recourse but to put a good face on their parents’ behavior. To realize that one’s parents are vicious or frankly deranged leaves a child desperate and hopeless. If, on the other hand, the young one can find some reason to continue to admire the parent, he may find his home life at least slightly less terrifying. Kids in this situation are desperate to find any signal of hope about the future. If they see their predicament for what it is, hope is dead. They are stuck and there is no place to go. It is therefore (in some sense) more comforting to believe that the reason for the mistreatment is their own fault, than to think that their elders are simply evil. If mom and dad are believed to be crazy or vicious, the child can only despair. On the other hand, if the young one believes that his behavior is somehow deserved, then by working to change himself he can at least imagine that he will win better treatment from his folks. With no alternative family to which to compare his situation, the child has no model of parenting that is different, no clear standard that tells him that his parents are corrupt, at least until many years into the abuse at a time when he is older. If, in his effort to normalize the situation, the child does find something admirable about the parent, and perhaps even something good about that person’s behavior, he is more likely to emulate it later. Furthermore, in trying to obtain a sense of mastery over his life, kids will often experiment with the very behavior that has been perpetrated on them. That is, they may obtain satisfaction (as well as an outlet for their anger) by being brutal with others, who might be their siblings or their school mates. One could go on about this subject for quite some time, but if you’d like a place to start exploring it, you might want to read For Your Own Good by Alice Miller. Miller looks at case histories of abuse, including some very controversial speculation about Adolph Hitler and what childhood experiences might have contributed to his sociopathy. It is definitely worth your time and attention. 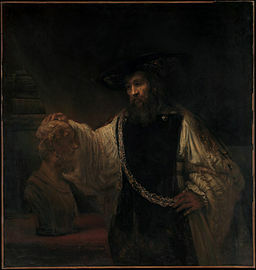 The image comes from the MGM movie, Julius Caesar. 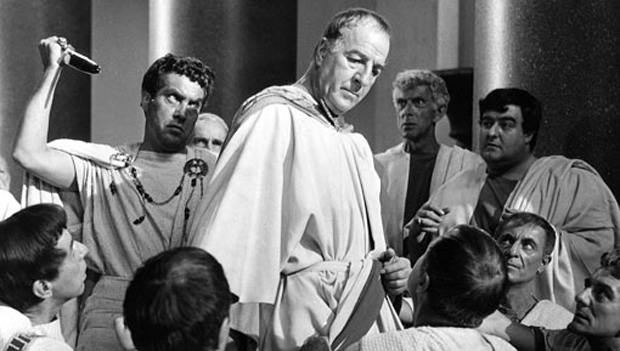 Casca, about to stab Caesar, is played by Edmond O’Brien and Caesar by Louis Calhern. The movie features Marlon Brando as Marc Antony and James Mason as Brutus.